The principal aim of this report is to assist all those concerned with chemical analysis of hardened Portland Cement concrete. After the Introduction, Chapter 2 addresses the important issue of sampling and specimen preparation. 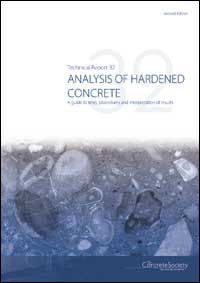 The following chapters provide detailed guidance on the analysis techniques that are available for determination of concrete constituents and concrete properties. These chapters are presented with a separate section for each concrete constituent or property. The Working Group devised a laboratory trial of selected chemical analysis methods to assess their accuracy when used for testing contemporary concretes (including mineral additions and chemical admixtures). Eleven commercial UK laboratories participated in the trial. Details and findings are presented in the report.